Rise of the Battleship II is currently in the final stages of development. So pre-dreadnought fans stay tuned for more news! Needless to say, we are excited the the starship gaming community has embraced Colonial Battlefleet with such enthusiasm. 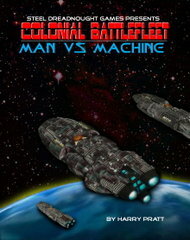 Colonial Battlefleet: Man vs. Machine has already reached 'Copper' best seller status in just two days, placing it in the top 2% of products sold though the site. So, once again, we owe a big thank you to our fans for your support! Thank you!!
. . . stay tuned for the release of Rise of the Battleship II. So we're back from vacation and ready to work! Went on a cruise, and it was lovely! Found myself ranging distances to other targets. . . I mean. . . cruise ships from the balcony of my stateroom. I'm convinced that if some cruise line would just set up a 40mm mount on the bow, and charge people to shoot it while in the open ocean. . . . maybe even provide target buoys, that cruise line would be the most popular cruise line in the world and would practically be able to print money. 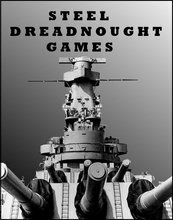 Maybe Steel Dreadnought Games should expand into the cruise industry? Just need about a billion and a half in start up capital. Any offers? Anyway. 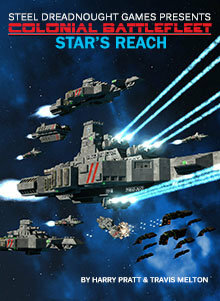 . . we're back at work on our first fleet book supplement for Colonial Battlefleet. Man vs. Machine, and we're very excited about making it available to the starship gaming community. 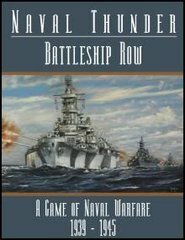 Naval Thunder: Rise of the Battleship II is also on deck and still planned for this year. Check out our forums for a number of other games we are considering, and give us some suggestions of your own! Steel Dreadnought Games has released an update to Colonial Battlefleet, based on player feedback at the Steel Dreadnought Games (SDG) forums. A core design goal for Colonial Battlefleet was to bring to market the first unbreakable construction system in the starship gaming genre. After it's initial release, we sought feedback from our customers, and the consensus of opinion was that in achieving our design goals, we'd been a touch too conservative in some areas - including the always problematic issue of space fighters. Together with our forum regulars, we waded into the details and managed to increase the potency of a couple of weapons systems (including fighters) that had been slighted - without jeopardizing game balance. While we were at it, we made a few tweaks to the tech trees and starship roles, to better ensure the competitiveness of all the different options. We owe a big 'thank you' to our loyal customers for helping us make Colonial Battlefleet the best game it can be, as well as the hottest-selling starship game on the market. Players of Colonial Battlefleet should be on the lookout for the first two Fleetbook expansions to be released later this year with more weapon systems, more options, new fleet lists, and expanded rules for further tailoring the game to specific styles of space combat. The campaign system is also in development and is targeted for release in the first half of 2011. As always, existing customers can download the updated version for free from Wargame Vault. The starship builder tool has also been updated to reflect the changes. The Colonial Shipyard shipbuilding tool has been updated to version 1.1. - Fusion torps are now purchasable as equipment for ship carrying TL 5 fighters. - You can now create and save your custom factions. - A few minor typos and erros have been corrected. As always, existing customers can download the latest version for free through their wargamevault.com account. We want to say a big thank you to all our customers for your amazing support and enthusiasm for Colonial Battlefleet and our other games. Hearing your stories of how you've played and enjoyed the games are what really make it all worth it. If you have some stories to share, head on over to our forums and tell us about them! We'd love to hear them! In the far future, Terran colonies are warring amongst themselves, even as a hostile xenophobic race approaches, bent on scouring all 'alien' life from the galaxy. Take control of a task force of starships from your colony world and lead your fleet to victory or die a horrible death in the cold vacuum of space! Anything from a stealth destroyer to a mighty battleship is yours to command. Colonial Battlefleet features easy to learn rules and exciting game play with minimal time spent waiting between turns. Shooting and damage resolution is easy and yields plenty of carnage. Best of all, Colonial Battlefleet is not a "luck of the dice" game. Although the rules are very straightforward, the game offers tremendous tactical depth and your command skills will be put to the test! There are no cumbersome or complicated systems to slow down play. All your attention will be focused on outmaneuvering and outwitting your opponent - not trying to remember rules. 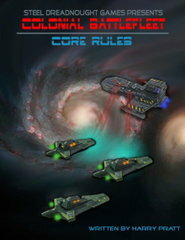 The core rules come with a rich background which includes three playable factions. In addition, rules for creating your own factions are provided, and the system will support starship combat from any sci-fi setting. Technology trees allow you to easily tweak the rules to match the style of starship combat from your favorite books, movies, or TV shows. Ten starship roles like 'Flagship', 'Battleline', or 'Screen' that define each ship's purpose and gives them bonuses that are relevant to that mission. Optional rules for boarding actions, black holes, planets, warp storms, relatavistic distortion, the dangers of simultaneous warp point transit, and more! Customers with Excel can take advantage of the point-and-click starship construction tool that is included with the files. You can even save your classes and print off entire fleets in mere minutes. Colonial Battlefleet represents a new benchmark for fun in starship gaming. Forthcoming products include a strategic campaign system, as well as fleet books for several popular miniature lines providing official stats and custom rules for each. There can only be one! Make sure it's yours. 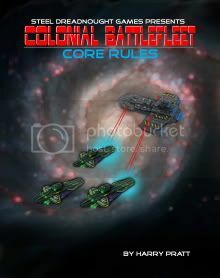 Colonial Battlefleet is available as a PDF download through wargamevault.com for $19.95. 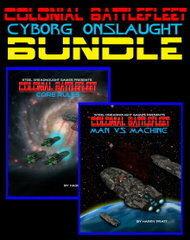 See the Colonial Battlefleet page for more information, or our products page to purchase. Just a head's up. Things have been crazy busy around here, and its caused some delays on getting Colonial Battlefleet out the door. It's been in final stages for a month now. But things are turning around. We're going to try real hard to get it out in May, so keep your eyes peeled for the announcement. We're sorry for the delay, but when it's out, we're sure you'll feel your patience has been well rewarded! If you don't manage to snag a ticket, never fear. It's pretty common to have at least one no-show each game. So bring your generic tickets and just show up. We'll do our best to fit you in. With all the events we're running you've got a pretty good shot at getting in sometime.